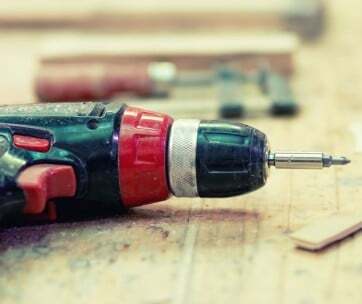 If you work in the building trades or are simply a dedicated DIY enthusiast you need the ability to clamp, sand, cut, bend and/or otherwise work on a variety of materials for a variety of applications. While the sawhorse continues to find a place on the construction sites of the world the portable workbench is today the preferred assistive device for sanding, planing, varnishing, sawing, repairing appliances, drilling, holding pipes, gluing and a whole lot more. Below we’re going to take a close look at the best portable workbenches on the market today followed by a brief buyer’s guide. The Keter Folding Compact Workbench has an unorthodox appearance but there’s nothing unorthodox about its ability to deliver a solid, dependable platform for all your everyday construction and household tasks. The work surface is a fairly unremarkable 33.5 x 21.7 inches but what is remarkable is that surface can withstand loads of up to 1,000 pounds. There is minimal assembly required and once put together opening and closing the bench takes just a few seconds. The clamping system isn’t going to win any awards but overall the Keter Folding Compact Workbench will deliver the durable, versatile work surface you need for less than the price of a good pair of work boots. The WORX Pegasus Multi-Function bench provides more than 6 square feet of surface area to work with and has a 300 pound load capacity. If you’re really in need of an expansive surface you can join 2 of these puppies together and create one behemoth of a workbench with a load capacity of 1,000 pounds. There’s a full array of measurement indicators, a simple and effective clamping system and the whole thing folds up to virtually nothing when you’re done. The lower shelf holds related items and there’s a built in slot into which you can slide a power strip for your drills, saws and other electric tools. The Workmate from Black and Decker revolutionized the work space when it was introduced more than 45 years ago. In all that time it’s undergone a number of refinements but the current Workmate 125 still bears more than a passing resemblance to its distant ancestor. And that’s actually a good thing because if something works why mess with it? If there’s been one aspect of the Workmate that has consistently generated comment over the years it’s the less than spectacular amount of surface area it provides. But while the 125 won’t bring an end to that discussion it will allow you to easily transport it wherever you need it, hold virtually anything in its rock solid grip and set you back no more than a large pizza with everything. In short, the Workmate 125 is unadorned, unspectacular functionality of the highest order. Be sure to also check out our list of the best nail guns for more great items like this. The Finether Folding Workbench is a Workmate clone that takes just about everything that’s great about the B&D bench and adds a few touches most craftsmen will appreciate. This portable folding workbench unfolds in a snap and, like the Workmate, excels at holding large, oddly shaped objects nice and steady so you can work on them. Where it has a leg up on its progenitor is that there are measurements printed right onto the work surface so you don’t have to keep reaching for the tape measure. The Finether is rated to 330 pounds and has a robust frame that maximizes stability. Overall it’s extremely lightweight and it may be the easiest foldable work table on the market when it comes to setting up and taking down. For more great tool, check out our laser measuring tools review. 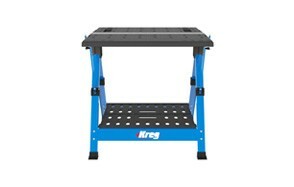 The Kreg KWS1000 Mobile Project Center is that rarest of animals, the good looking portable workbench. The looks however are just the first thing that will catch your eye. After that you’ll be drawn to the heavy duty, heavy gauge steel in the legs, the above average sized work surface and the simple but effective clamping system. The KWS1000 is built to last and designed to facilitate your ability to get the job done. 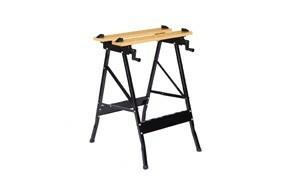 You’ll pay a bit more for this particular folding workbench but you won’t regret that you did. The WM225-A is a ramped up version of the venerable basic Workmate. The 225-A exhibits all the best qualities of the base model – versatility, the ability to grasp and hold all manner of oddly shaped objects, affordability – but adds a few extra touches that make it a sound choice even for those engaged in heavy duty construction projects. Those extras include a 450 pound carrying capacity, a larger work surface and generously proportioned lower storage shelf as well as scales printed on both sides of the work surface. It’s a good thing we don’t purchase a portable work bench based solely on looks because if we did we’d give the 700 pound variant of the Keter Folding Workbench a wide berth. Alas, we make our judgments based on performance and this puppy performs admirably time and again. It includes a more than serviceable clamping mechanism, has one of the largest work surfaces of any foldable work table, opens and closes quickly and without trouble and stores away easily against the wall or under the stairs or in the shed. Black+Decker take their Workmate into uncharted territory with the WM1000. With this model the company attempt to address every conceivable complaint that may have been levied against their basic Workmate models. The result is a tough, extremely stable, extremely versatile portable workbench with a large (for B&D anyway) work surface, a 550 pound carrying capacity and more scales and configuration suggestions than you can shake a stick at printed on that nice large surface. It’s not as big as it looks in some photos but it’s every bit as tough as it looks. The X-Tra Hand 2-in-1 Portable Workbench features a patented design that incorporates features you expect to see on a permanent workbench including electrical outlets, tool slots and an expansive work surface. But while you gain quite a bit in useable work area you lose the vise-like qualities that make the folding workbench such a work horse. That minor quibble aside the legs of the X-Tra Hand 2 in 1 can be extended to form a standard height work table or lowered if you really need to get your back into the job. There’s a protractor and standard scales printed on the work surface and a utility tray that accommodates all your relevant tools and peripherals. Be sure to combine this with one of the best bench grinders from our list. Underneath the shiny yellow paint job and durable steel frame is a Workmate dying to get out. And that’s fine because if you’re going to use something as an influence it should be something with a proven track record. Needless to say the Performance Tool W54025 Portable Workbench doesn’t break any new ground, but it does is reestablish older ground, with conviction. Build quality throughout is also impressive, considering the price point. The W54025 does an admirable job grasping even the most awkwardly shaped objects although the scant 200 pound carrying capacity was an unwelcome discovery. Don’t forget to also check our guide to the best bench vises! The items on our list are chosen through a combination of real world experience, interviews with craftsman and others who have used the items and information provided by the manufacturers. Size - If the size of the work surface is important to you then you’ll likely want to avoid the WM125 from B&D or one of its clones since the actual work surface on those items is virtually non-existent. (Where the Workmate and its progeny do excel is in their ability to take a firm hold of virtually any type of item no matter how large or small or how oddly shaped.) As for height, there is nothing that will generate back problems quite as quickly as having to bend over a bit to reach the work surface of a portable bench. If you’re a tall individual either make sure your bench is of an adequate fixed height, or that it has legs that can be adjusted to bring the bench up to where you need it. Weight - As a general rule the heavier the workbench the more stable it is. 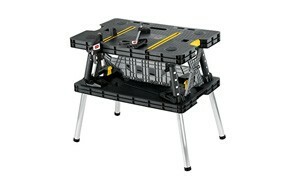 But weight becomes an issue if you take the foldable work table with you wherever you go. You don’t want to be toting a 50 pound bench around on a daily basis if you don’t have to. Many of the lighter portable workbenches on this list have wide stances that provide excellent stability. So that may be a practical option if you move around a lot with your work. Assembly Difficulty - None of the workbenches on the above list require an engineering degree to assemble. They wouldn’t be very practical if they did. Still, some are easier to put together than others. So if the idea of having to assemble your new workbench just turns you off as a matter of principle then go for one of those that require minimal assembly like the WORX Pegasus. 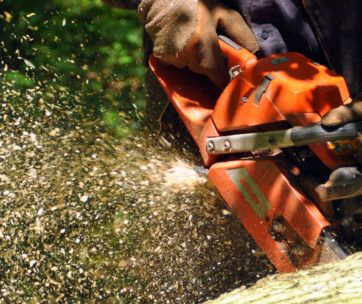 Stability - Any time power tools and heavy loads are involved you want to be sure you have a stable platform to work on. As we mentioned above stability is often a function of weight. But there are other considerations that play into stability as well including a wide stance, non-slip feet and a strong, steel frame. In general if a folding workbench is on the high side and yet has a narrow footing you should be wary about using it work on heavy or awkwardly shaped items. Sturdiness - It should go without saying that a portable workbench needs to be sturdy. After all if you are taking it at its word and resting 300 or 400 pound items on it you need to know it’s not going to buckle under the weight. If you have the chance you should always verify the carrying capacity with the manufacturer. The importance of this was driven home during our testing when we found more than a few cheaper benches that were advertised as being able to handle impressive loads but which were clearly straining to do so. Accessories - The best portable workbench is just that; a portable workbench. You don’t expect or want it to be tripped out with LED lights on the legs, a Bluetooth speaker or an app that will allow you to watch it collect dust when you’re on the other side of the world. Still, there are a few accessories that come in handy including scales on the work surface, non-slip feet, storage for nails, screws and hand tools along with an effective clamping mechanism. Foldability - One requisite of being portable is that the workbench be light enough to carry around with you without hurting your back. The other requisite when it comes to portability is the ability of the workbench to fold down to a convenient size for storage. With some you’ll be able to hang them on the pegboard in your workshop. With others you’ll need to find another place to store them. The main point, however, is that you can easily store the portable workbench in an out-of-the-way place once you’re finished with it. If you can’t all you really have is a fancy sawhorse. Bench Top - We mentioned the size of the benchtop earlier but it bears repeating. Always keep in mind how much work surface you’re going to need to be able to do your job effectively. There are plenty of portable workbenches out there that provide 6 or even 8 square feet of work surface. Just as there are a number that provide little by way of a workable surface. Those without much work surface are mostly purchased for their ability to hold objects in place while you work on them. Which is different than working on the surface of the bench itself. Clamping - Some portable benches like the X-tra Hand 2 in 1 profiled above provide no ability to clamp or otherwise grasp items. And that’s fine if you don’t do the type of work that requires you hold things steady while you work on them. If, however, you need to cut, drill, plane or otherwise manipulate wood or any other material you’ll want a folding workbench with a reliable clamping system or even one that is essentially a standing vise, such as the Workmate. Q: What are Portable Workbenches? A: As cities spread to the suburbs during the middle and late 20th century it became important for craftsmen to become mobile in order to get to where the new work was. Gone were the days when they could bring everything back to their shop to work on it. 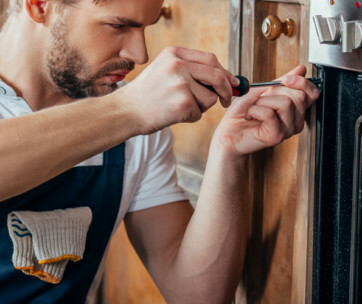 At the same time the rise of the DIY movement, fueled by innumerable TV shows, magazines and later, websites, created a burgeoning market for devices that enabled homeowners to perform various tasks around the house without turning the home itself into a workshop. The portable folding workbench fulfills both of these needs. For craftspeople it provides them the ability to set up shop wherever they go and for DIYers it allows them to indulge their love of tinkering without having to set up a workshop in the home.